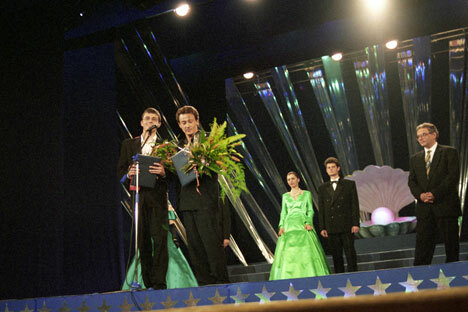 The saga began in Moscow in 1997, backstage at the Nika awards, the Russian version of the Academy Awards. I was a reporter writing about the whole thing, and I struck up a conversation with him. We talked about his award-winning film based upon the Chechen war that had garnered him so much international attention. Then, somehow, that conversation gravitated to talk about the circus. Prisoner of the Caucuses - trailer (in Russian). You can view the full movie with English subs here. Source: YouTube. Don’t ask me how that happened. I’m going to blame it on fate and destiny. All I know is that we quickly found a common bond: a love for the red ring and the characters that perform in it. The only difference had to do with the age at which we discovered this zany world. His started as soon as he could walk. He grew up literally next door to the Old Moscow Circus, he said, and spent his childhood playing with circus kids, at the circus, running through the halls of the circus, outside the circus, anywhere they could. That night backstage at the Nika awards, as the evening dragged on and on, he talked openly of his lifelong dream to write and direct a film about a bear in the circus. He seemed to have it all set up in his head. It would have a traveling circus, a beautiful girl and her lover, a young man, who kept turning into a bear. Somehow the three of them would find true love. Weird. Whatever. At my invitation, Sergei and I met at the Old Moscow Circus a few days later. Built in 1880, it was one of the oldest permanent (non-traveling) circuses in the world. Unlike many of his Hollywood counterparts I’d interviewed, he was surprisingly down to earth, kind, interesting to talk to, and even interested in my life. But what he really was interested in were the bears that performed in the middle of the red ring. They did everything from jump rope to ride motorcycles, and many other tricks that would have animal rights advocates screaming bloody murder. Read the second part of the story tomorrow!